From the author of the beloved New York Times bestseller Wicked, the magical story of a toymaker, a nutcracker, and a legend remade . . .
Hiddensee: An island of white sandy beaches, salt marshes, steep cliffs, and pine forests north of Berlin in the Baltic Sea, an island that is an enchanting bohemian retreat and home to a large artists' colony-- a wellspring of inspiration for the Romantic imagination . 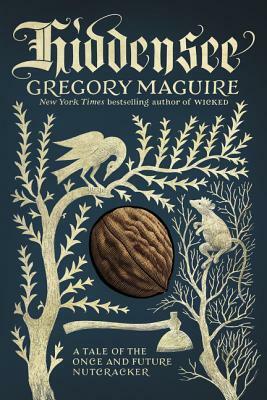 . .
Having brought his legions of devoted readers to Oz in Wicked and to Wonderland in After Alice, Maguire now takes us to the realms of the Brothers Grimm and E. T. A. Hoffmann-- the enchanted Black Forest of Bavaria and the salons of Munich. Hiddensee imagines the backstory of the Nutcracker, revealing how this entrancing creature came to be carved and how he guided an ailing girl named Klara through a dreamy paradise on a Christmas Eve. At the heart of Hoffmann's mysterious tale hovers Godfather Drosselmeier-- the ominous, canny, one-eyed toy maker made immortal by Petipa and Tchaikovsky's fairy tale ballet-- who presents the once and future Nutcracker to Klara, his goddaughter. But Hiddensee is not just a retelling of a classic story. Maguire discovers in the flowering of German Romanticism ties to Hellenic mystery-cults-- a fascination with death and the afterlife-- and ponders a profound question: How can a person who is abused by life, shortchanged and challenged, nevertheless access secrets that benefit the disadvantaged and powerless? Ultimately, Hiddensee offers a message of hope. If the compromised Godfather Drosselmeier can bring an enchanted Nutcracker to a young girl in distress on a dark winter evening, perhaps everyone, however lonely or marginalized, has something precious to share.